Porchfests are annual music festivals held on front porches in small towns and large cities across the nation, bringing musicians and neighbors together to build community spirit. A fun, free community music festival held on front porches of vintage homes in the NW Washington Blvd neighborhood of Grants Pass, featuring music in a variety of genres, food, and art. Nearly 90 Musicians performing for your entertainment! Fantastic food! Great Arts and Crafts! New this year, the Rogue Gateway Rotary Club will organize the music festival. The club will continue using profits to underwrite programs for youth — including donating a portion of the proceeds to Family Solutions and CASA (Court Appointed Special Advocates) of Josephine County. 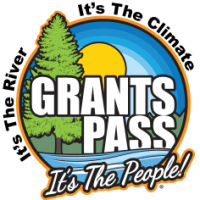 Hope you can join us for Porchfest Grants Pass 2019! *Maps of the host porches and performers will be available to attendees the day of the event to guide them through the festival. Donations made through the event website, through volunteers "passing the can" at each porch venue, from a portion of vendor sales and Porchfest T-shirt sales, and corporate sponsorships and donations of good/services will finance the event and provide revenue for funding needs for at-risk children.